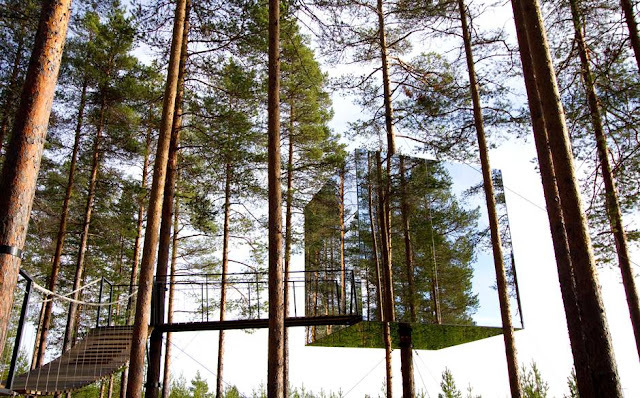 Tree hotels, while cool, are totally passé. Been there, done that, amirite? Well, the Swedes have stepped up their tree hotel game with Mirrorcube, the world's first invisible room. Nestled in the trees of the town of Harads in northern Sweden, the cube-shaped room is made of mirrored walls so that it blends in with the environment and virtually disappears. Even the birds didn't know it was there and kept crashing into it, so the designers had to add on an infrared film that only they could see. My only question: When is Ikea gonna start selling these invisible cube rooms? I need one for my backyard. Although, thinking about it, the self-assembly could get a little tricky.